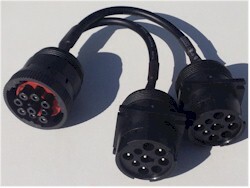 This adapter cable allows a J1939 Scan Tool (a scanner designed to plug into the round J1939 9-pin Deutch connector on a vehicle) to be used with a J1939 equipped vehicle that uses a standard OBD2 style connector. This adapter mates with a J1939 vehicle and allows an OBD2 style tester connection to fit. The J1939 +/- data lines are connected to the CAN +/- lines, and the power and ground lines are also connected. The most common application is to connect a GPS Tracker that is meant for an OBD2 vehicle to a vehicle that has the 9-pin round Deutsch connector. 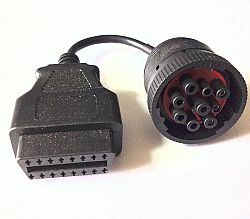 This adapter mates with a Type 2 (Green connector) J1939 vehicle and allows an OBD2 style tester connection to fit. 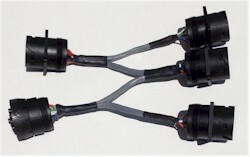 The J1939 +/- data lines are connected to the CAN +/- lines, and the power and ground lines are also connected. 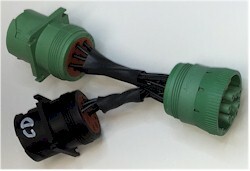 A standard J1939 Connector (Type 1) will not plug into a Type 2 (Green) connector. This adapter allows devices which are capable of reading the higher data rate of Tyoe 2 to connect. 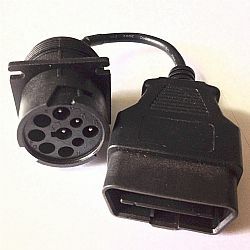 This adapter allows a GPS tracker designed for an OBD2 connector to connect to vehicle with a round 6-pin J1708 connector. Six foot Extender, Type 1 Female to Type 1 Male.